Interview with Skupina about the exhibition Nothing to Hear (23. 11. 2017 – 4. 3. 2018 in IGLOO sound gallery in Iglau / Jihlava), 22. 11. 2017. Interviewed: Filip Johánek a Ján Solčáni, questioned by: Lenka Dolanová. Your installation Nothing to Hear follows the piece by Alvin Lucier I Am Sitting in a Room from 1969, which deals with resonances of a voice in space during its repeated recordings. You created your original recordings in KRAvín in Hranice u Malče. How was it made and how did you afterwards work with it? Filip: The first recorded sound – the first layer, as we call it – was silence. Then we replayed it and recorded again. No edits were made. The only thing we did was that always after recording one layer, we amplified it. We could had been even more “true”, if we would had just replayed into the space, what we recorded, without amplifying it. We amplifyied it so that the microphones would take it better. That may be the only manipulation we did. Ján: We actually multiplied the emptiness of the space, until noise emerged. Filip: We didn’t tackle frequencies, dynamics, processing at all. We just edited, cut out the pieces we liked, we put them together. We took the whole thing and gave it to Tomáš Vtípil who mastered it, made it playing well. When you brought the recording here, into the IGLOO sound gallery, did you work on it still? How did you conceive it regarding the specific space? Filip: Tomáš prepared it, made the distribution – we use five chanels, two steros in front, two at the back and basses – , after discussing it with us he made the pre-mixing. We know it is a specific space with a huge echo, it is not a studio space. Somehow it sounds here by itself. He only dealt with proportions, that everything sounds as we wish. To say it simple, we were adjusting it in relation to the specificity of the given space. We reduced it, if something would terribly hurt your ears. And something we might wish to hear in it and it would somehow disappear, we just raised. Let’s say that Tomáš Vtípil did a specific sound design for the given space, so that it ideally sounds as we imagined it. Ján: We also wanted to admit the space itself. Filip: Yes, that is an important information. In the text accompanying the exhibition you wrote that you work with the resonance of space, and at the same time your work deals with the loss of voice or utterance of an individual. So it has an additional conceptual level. Ján: It comes from the experience that we had during our KRAvín residency. We were at the pub U Bambuchů in Libice nad Doubravou. While I was standing in front of the pub, a local guy came to me. Just at the moment when he was standing there smoking, bells started to ring. I was asking those basic questions, like how often they ring and so on, and at the end it came about that the guy is a former bellringer. He began to describe the history of the church and various characteristics of the bells, how you ring the bell that has a different mix of alloys et cetera, and it all ended up with him saying that one day he will wake up and go to ring his death bell for himself and then he will lie down in the coffin, because nobody else will do it for him. The opening of his monologue was quite educatory for me, and within a second it changed into a testimony, perhaps even a cry of a completely resigned person who is expecting nothing any more. When I was telling it to Filip later, and when we were thinking about it, we though about that an individual in space, statement, history or memory of an individual can easily perish. He was telling us something and when he finished his monologue, it disappeared. That was the starting point of our final work. We made a very noisy emptiness from an empty space by repeatedly sending the previous recordings into it. An indivudual can perish in this noisy emptiness. The sound image is accompanyied by a video – I don’t know if we can talk about a video, because there are fragments of text presented here in the form of subtitles. They result from the work by Milo Urban Živý bič, a dialogue goes on in here between two people, one is telling something to the other, who listens to it, but at the moment when s/he stops listening, the whole meaning of the word and the sentence perishes. It disappears into the unknown. I found it interesting what your were saying yesterday, that the frequency of the recordings you present is different from the frequency of voice. There is a huge noice, but we can understand what people say. That is surprising. Ján: This is a bonus of the sound side of the work, that the frequencies, in which human voice occurs, are not present in the recordings. So it wasn’t your intention? Filip: No, no, we found out yesterday. When we turned it on in here, we talked, and I was saying, actually it is loud, but I understand myself, I hear myself. And Tomáš was saying: well, there is nothing of those frequencies in it. You work as Skupina, and you already explained somewhere, that Skupina can be anybody, but still, could you define somehow, who or what Skupina is? Filip: I will tell the names, it is perhaps the best to start with: Ján Solčáni, Tomáš Šenkyřík, Zdeněk Tomášek, Jana Kočišová, Filip Drábek, Martin Flašar and Filip Johánek. It is a free association of authors, Martin Flašar is theoretician from music department in Brno. All of us are active in sound and we loosely cooperate. For example we released the recording by Tomáš Šenkyřík and at that occasion we asked him if he wanted to be a part of Skupina and he said yes. And he already calls us sometimes suggesting we could make something as Skupina, our cooperation is becoming more intense. The same story was with Filip Drábek, we releaced his MC tape, they are a longtime friends with Ján, so the connection is also intense and enjoyable. Ján: The initial motive of Skupina was, that we wanted somehow to follow the practice of field recording and soundscape. We figured out that the personality of an author, or a person holding the recorder, is not essential at all. And when we were thinking about how to call this form, we choose the word Skupina, with the intention that there is no narrativ in it. Skupina can be anything and anybody, you cannot detect gender, social status, education, race, practically anything from it. It can be anybody and nobody at the same time. Filip: We like it that it is anonymous to a certain level. To a certain extent we do not want names. Of course, sometimes you have to present them, like when you sign a contract. When somebody asks who Skupina is, you tell it, but primarily we wanted not to communicate with the name of an individual. Ján: Somehow to avoid the aura of authorship. You mentioned that somehow your focus is on field recordings, but you do not handle them in a puristic way. You work further with them, in contrast to other people who record and leave it in a pure state. Do you have a certain way of working that you are interested in or that further connect the various authors? Filip: We exist for 2 years. At the beginning we really just wanted to push “record”, leave, come back and push “stop”. Actually it was working like that until this exhibition, you record something outside and you don’t manipulate it too much. Of course we can talk about it in a way that just by being there, taking the microphone, going there in the morning or in the evening, going there and not somewhere else, you totally are the author. Nobody else would do it. If a tram is passing by, ok, that is not your choice, but many things in that concrete time and space are, you decide, you are the decisive factor. But at the beginning, we were mostly into field recordings, Tomáš Šenkyřík and Jana Kočišová do it as well, we released a recording by Filip Drábek, who was making field recordings in Iceland and putting some guitar into it. Skupina connects people who like field recordings, that is the basic definition. For us it is the first situation when we have an exhibition. We decided to work with field recording from KRAvín, but to cut out our tradition, our initial intention. We want it to function as an exhibition, we want to adjust it to the gallery space. For example in the sense that it is not linear. We recorded some 134 minutes in KRAvín, from the first layer when we were recording silence, till the tenth, when it contained terrible resonances and it was almost unbearable. So we said that our aim isn’t to replay 134 minutes in loop but we choose what we like, what somehow works and represents the way how we want to express resonances and the concept mentioned by Ján. 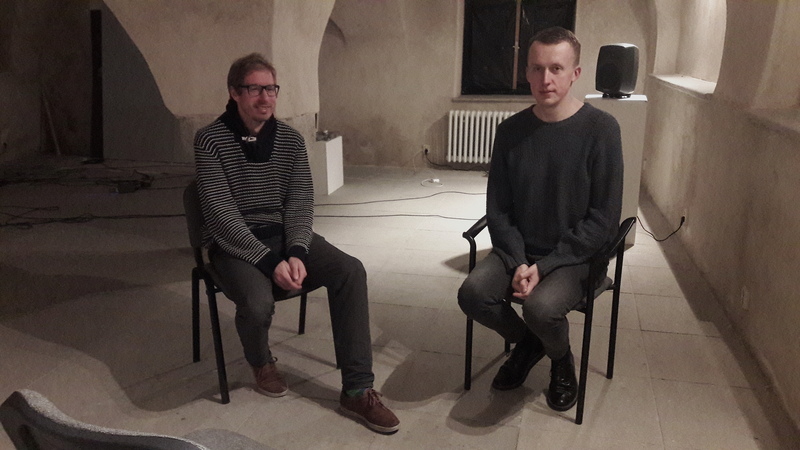 Ján: We decided for this way of working because we realized that the meaning of the work stands outside of the work itself, that it is not possible to hear it in the recording, it is not possible to catch it solely from the text. In that case we found it accessible to work with the method that we chose. Filip: I found field recordings different from music. For twenty years I played with the band, and the musical world had quite negative impression on me. I felt I cannot express myself too much, and if, then I operate in narrow borders and the aura of the author is very much visible in it. As a prototype of field recording phase I considered being at ease, not doing art, being an innocent recorder. We’ve been working together for 2 years, and each new thing means long discussions, it really takes us a long time before we understand each other, say, what we do not want and do want. It is still in progress, including the fact, that now we for the first time decided to do an exhibition. To adjust the recorded material, make cuts in it, give it to Tomáš Vtípil who also intervened in it as author by suppressing some frequencies and emphasizing other. He had an info from us, that the basics is really a field recording, so we do not want him doing some brutal syntheses, but work with the “raw” material. Ján: Behind those 37 minutes that will run here in loop, are tens of hours of discussions, tens of pages of various notes, annotations and so on. Before we decide to do something, we more or less talk out holes in our heads.